Cod, lightly smoked on the barbecue grill, a gourmet fish course. This is a cross between smoker cooking and grilling, and it flavored the cod perfectly: a light smoke and dill combination. It needed nothing else. Put some charcoal in the barbecue, off to one side and light it. If you are using small, commercial wood chips, put them in water to soak. Mix the soy sauce and the olive oil. Brush on the fish. Sprinkle the dill weed on top. When the coals are glowing, add the fish - either in a basket or on a grill mat of some sort, to the other side - in other words, not over the coals. Throw some wood chips on the coals and cover. Check it halfway through and add more wood chips if it has stopped smoking. It's done when if flakes easily with a fork. We left ours on for about 30 minutes. 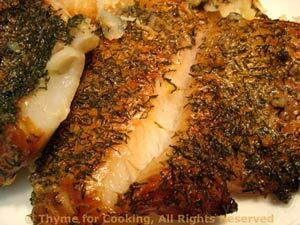 To use oven: The fish could also be baked, 400F (200C) for 15 to 20 minutes. It won't have the smoke flavor, of course, but the dill and soy sauce add a lovely flavor on their own.